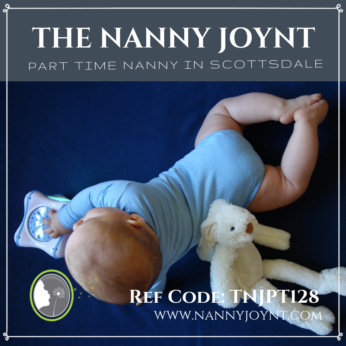 The Nanny Joynt is thrilled to share a wonderful part time nanny position available with one sweet baby boy! These new parents are warm and inviting and are looking for a nanny who will take amazing care of their little one. This family is seeking a Part Time Nanny to join their family. Their sweet little boy is 4 months old, he has had an NCS and is on a great schedule. He is very active and has some reflux, so a nanny who is familiar with this would be ideal. Mom can work from home in a separate area and will be in and out during the day. Mom prefers the nanny to work 5- 6 hours shifts, but is also flexible for the right candidate. When applying please let us know which schedule you are interested in. This position is offering $17 – $23 per hour with paid holidays, paid sick days, paid vacation and guaranteed hours!!! The family would also love for their nanny to be available to travel with them on long weekend trips occasionally. They are offering a per diem travel rate as well your hourly pay. This sweet family is looking for a nanny who is extremely gentle, loving and focused on the care of their baby at all times. They want their little boy to be loved and really cared for. A nanny who will engage the baby and work with him on reaching his developmental milestones. They want someone who values education and will teach their son new things. The nanny should have newborn/infant experience. They want their nanny to be playful, attentive, hands-on, laid back, calm, and patient. A nanny who really loves her career as a nanny and enjoys being at work each day! They are seeking a nanny who will help them be the best parents they can be every day. They are business owners and really focus on their family time. They prefer a nanny who will make each day fun and effectively communicates the days activities with them. This family would like their new nanny to up to date on all vaccines and are willing to pay for this before you begin your employment with them. Child related duties will include overall care of the baby including but not limited to: feeding, diapering, naps, helping baby hit each developmental milestone, tummy time, playing/reading, singing and outings to the library, etc. Cleaning up after self and baby, washing all bottles, baby laundry, maintaining the nursery and baby food prep. Household responsibilities will include cleaning up, load/unload dishwasher, vacuuming areas where baby plays. Family meal prep. (Mom prepares a menu for the week), helping to maintain organization around the home. The family does have a house cleaner who comes once per week for deep cleaning. They are currently living in a condo while their new home is being built. They are looking at about 15 -17 months for their home to be complete. Their new home will be located at 44th and Lincoln. This is a wonderful opportunity for a nanny who is seeking a position with a loving and caring family! They are open and honest and will provide a positive work environment each day. They want their nanny to feel valued, appreciated and enjoy coming to work at their home!. They are fun and easy going and are excited to meet a wonderful nanny to join them in helping out with their baby boy! This family loves music, art, travel and are head over heels in love with their new son!